The INOUT from XAQUA is a super compact and easy to install overflow and a return system in one! 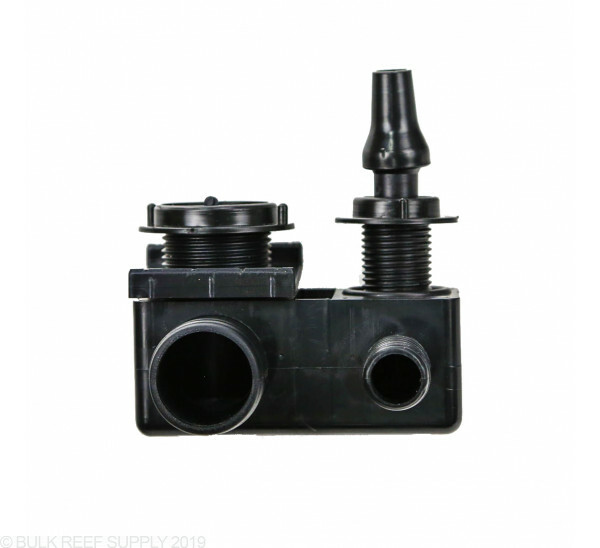 Made out of thick molded plastic that is 100% reef safe, adding an overflow for a sump to your tank is now easier than ever! 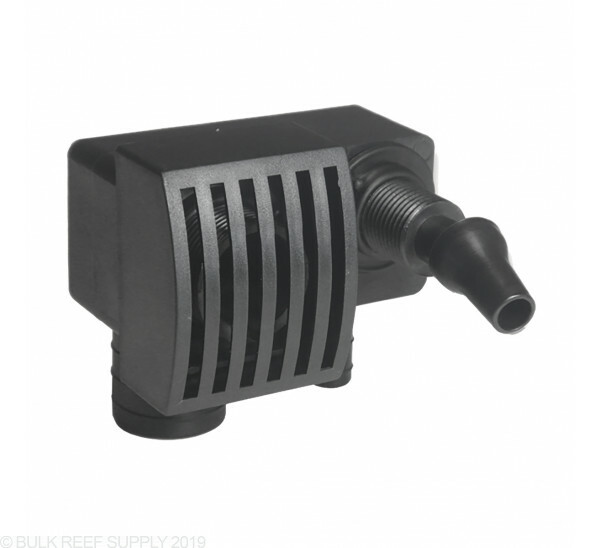 Every INOUT comes with a special return flow design that creates a gentle pulsing action as water travels from your return pump and then back into the tank. The wave-like effect does not require any electricity as it works off the energy from the water flowing through the INOUT. The return nozzle can be oriented in a variety of directions and even comes with an extra nozzle. 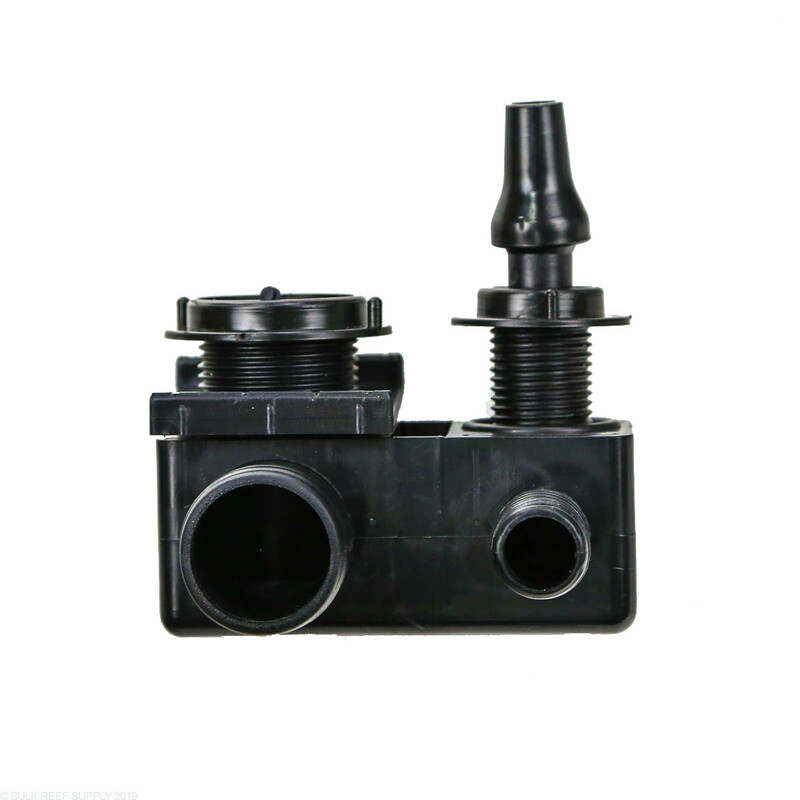 The INOUT can be adapted to work with 1/2" Loc-line but does require modification and may affect the return flow characteristics. The overflow section comes with a snap-on grill that helps keep snails, fish, and other debris from clogging the drain. The grill can be easily removed for cleaning and maintenance if the need should arise. The design of the INOUT allows it to use a single drain design without much noise at all. We have found with higher flow rates the drain may become audible, but with lower flow systems it is completely silent. Determine the mounting location for the INOUT and secure the drilling template in place on the tank, we suggest using strong adhesive tape since it will be getting wet during the drilling process. 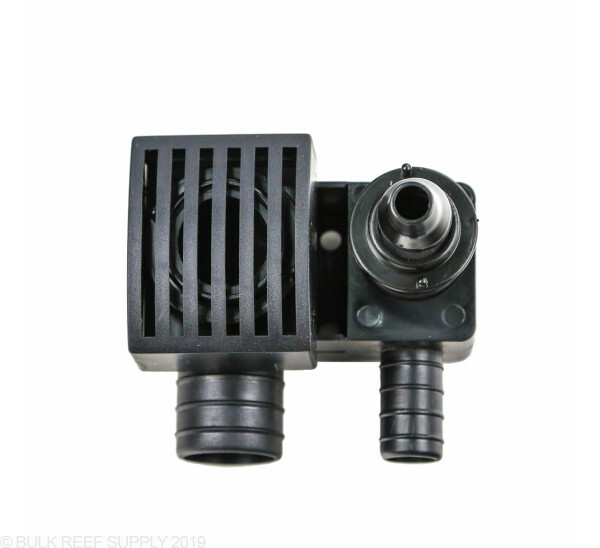 Drill the appropriately sized holes for the drain and return bulkhead to pass through your tank. Place the O-rings onto the threaded bulkhead fittings and fit the INOUT onto the exterior side of your aquarium. Secure the INOUT with the included nuts hand tight (do not overtighten). Attach the overflow grid and plumb the drain and return fittings with your favorite type of soft tubing. The INOUT can be separated between the overflow and the return box if you want to have them in separate locations. Every overflow box has an easy to separate perforation that can stay intact or be cut with a sharp razor blade. I have had this overflow/return installed on an IM 25 gallon lagoon for over a year now and have been very happy with the results. I love that you can separate the drain and return assembly is desired for more flexible installation options. The drain has been quiet and reliable and the return creates a nice pulsing feature to provide a little more turbulent flow in the tank. I’ve had this great overflow on my IM Nuvo 30L for the past year and couldn’t be happier. Its compact size frees up a great deal of space that an overflow tower would otherwise occupy. It’s also nearly silent – I actually had the first gen of the X Aqua on another tank, which made a noticeable amount of noise. My only complaints might be the that drainage cage slats might be large enough for a small fish to slip through, and that DIY drilling the holes into the aquarium glass can be nerve wracking.